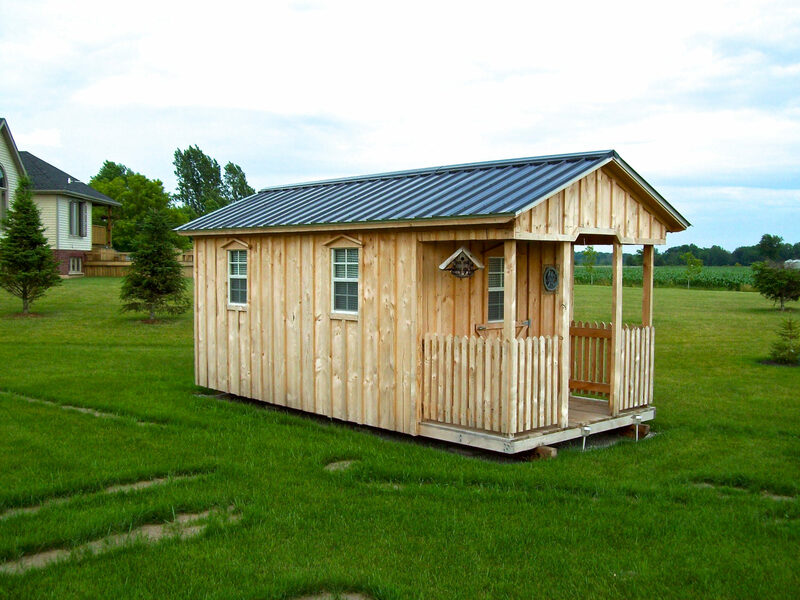 Testimonials - Amish Sheds Inc.
Want to know how happy others are to have their very own Amish Shed? Have a read and hear what some of our customers have to say about their experience in getting a fully built Amish Shed delivered to their home. 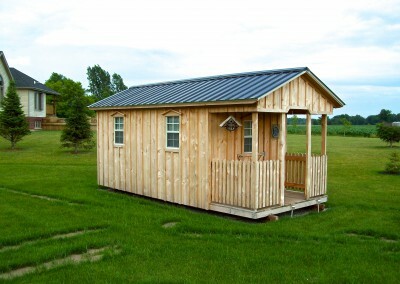 Getting your own Amish Shed is a no hassle building project. You won’t need to deal with materials, trades and the overall length of time that is typical with most on-site building projects. Our sheds are built indoors using quality materials and delivered to you as a completely built structure (Note: 12′ wide sheds require assembly of eaves). So don’t let us ramble on about our product, we already know how great they are, hear from our clients below! A big thank you to you and your crew at Amish Sheds for the two story bunkie you crafted for me. After meeting you at the Toronto Cottage show, I was impressed with the quality of your product. Compared to others on the market, I knew I was making the right choice going with your hemlock, rather than pine or pressboard offered by the other guys. You were easy to work with from the design stage to the build (being a rookie at building, you were a big help with answering my questions as I put the kit together, which, I may add, was relatively easy once I understood the basics). Your delivery team was excellent, professional and courteous. Most of all, the product is exactly as I thought it would be; a solid, well designed structure that looks fantastic, and that I know will be here long into the future. If any potential customers ever have questions about your product, please pass along my name to them; I’d be happy to share with them how great my experience was with you and your company. THE MATERIALS, THE WORKMANSHIP AND THE SERVICE IS SECOND TO NONE! 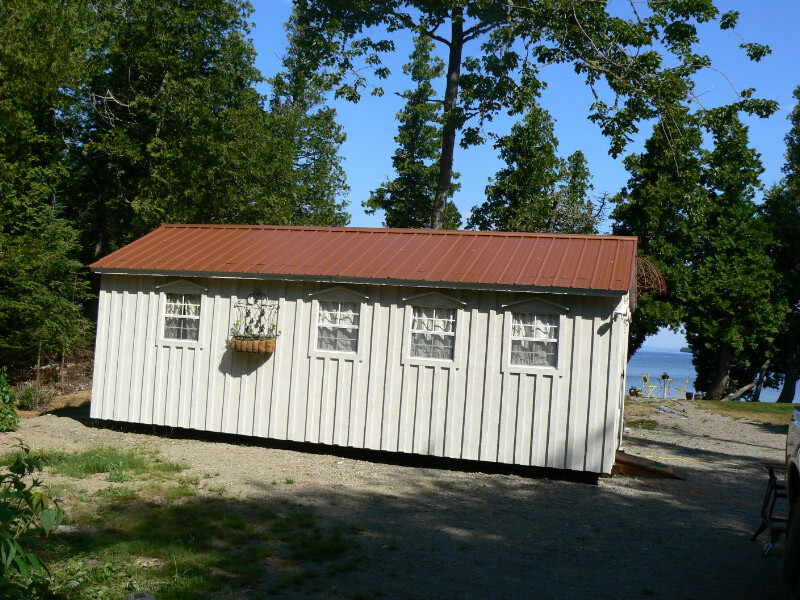 We are the proud owners of a 12′ x 24′ Bunkie which we designed and now it sits beside our Lake Superior shoreline property. It was made with the best workmanship! The website is exact to the finished product. The service we received from our contact Bobby Kozjan either by email or telephone was always courteous and prompt. Our Bunkie was ordered on April 20, 2015 and awaiting delivery to us on May 6, 2015. We were ready for it on May 19, 2015. Thank you Brad for the smooth delivery on site even though mother nature tried a fast one on us especially where temperatures were hot the day before delivery, but that is Northern Ontario for you. Please watch this site for a picture as we finish the exterior and interior. We now can enjoy it all summer long! Thank you Bobby. “The experience has been absolutely fantastic. The ordering process was simple, the customer service throughout was engaging and the final product was spectacular. I could not be happier with the end result. We are so very happy with our new Amish-built shed and truly amazed that it was delivered and placed in our designated spot despite some difficult obstacles. The quality of the shed compared to all the others we saw left all the others behind and we quickly focused and acquired the Amish-built shed. The shed has stopped and/or slowed down so many cars out back on the canal road that I have lost count. I think we have reduced speeding on that road by 5%. In the 3 weeks that the shed has been on our property I have given out 3 cards so far to those who have stopped and came over to ask. One amusing added comment. Last week I stopped for breakfast at the Good Eats Diner (a few miles away) and I got into a conversation with an 87 year old gentlemen who was, in his working days, a builder of schools. One thing led to another and then he asked me where I lived in the city. I told him the name of our street and he asked where I lived in relation to specific cross-street. When I said if he didn’t stop at the corner he would be in my front yard, his eyes lit up with admiration and yelled -you’re the one with that fantastic shed! Our thanks to Amish Sheds for a great addition to our backyard. Ted and Gloria, St. Catharines, Ont. I’ve never written a testimonial before because a product/service has never exceeded my expectations enough to warrant. I needed a shed that wouldn’t rot, looked good and still fit my budget. I looked at a handful of websites and visited several dealers from Home Depot to other custom shed builders as well as do-it-yourself kits. 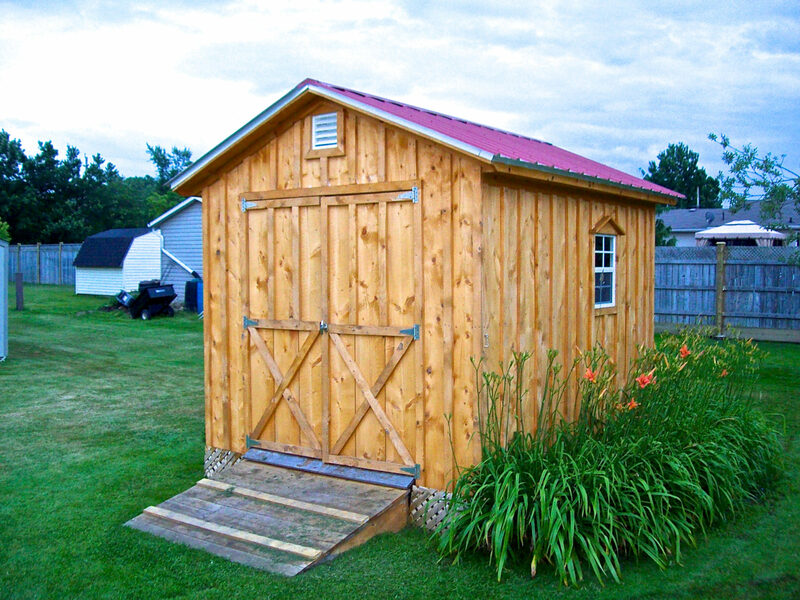 I found Amish Sheds while surfing on-line. I was thorough in completing my due diligence and found Amish Sheds was the most sensible solution. From a design standpoint, they are the only shed designed and built to last because the shed sits off the ground. Why put a shed on the ground….it will eventually rot, smell and attract insects. I read the testimonials on their website and felt they were worth a call….one of the smartest calls I ever made. Amish Sheds are wonderful people who go the extra mile. They are exceptionally proud of their business and stand behind their products/service. Communication was accurate, delivery times were bang on and the installation blew me away. I couldn’t believe how they fit my 7×16 into a tight spot with ease and confidence. 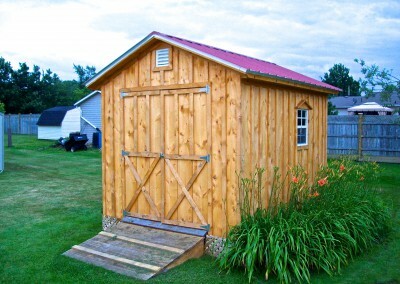 If you are a skeptical buyer by nature (like me)….relax…Amish Sheds is the real deal. Kudos…you truly earned my first testimonial. We love our Amish shed! Our custom requirements were no problem and our shed exceeded our expectations in every way. 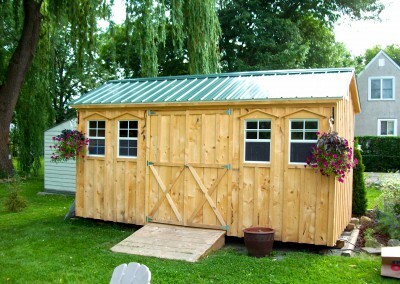 Amish Sheds were extremely helpful and simply a joy to deal with. We have two Amish sheds and are so happy we decided to buy these instead of a store-bought shed. These are so solidly made and unique looking. The sheds you find in stores are a lot of money for just a small size. We converted our smaller shed to a three season suite or bunkie. We converted the larger one to a workshop. We had the insides paneled, laid some flooring, and put some glass garden doors on one end. Amish Sheds were fabulous to deal with and we wouldn’t hesitate to recommend their sheds to anyone. We are and will be long term Happy with the shed, I think of it as more a piece of Artwork as you do not find this type of craftsmanship anymore. I feel very fortunate to be an owner. 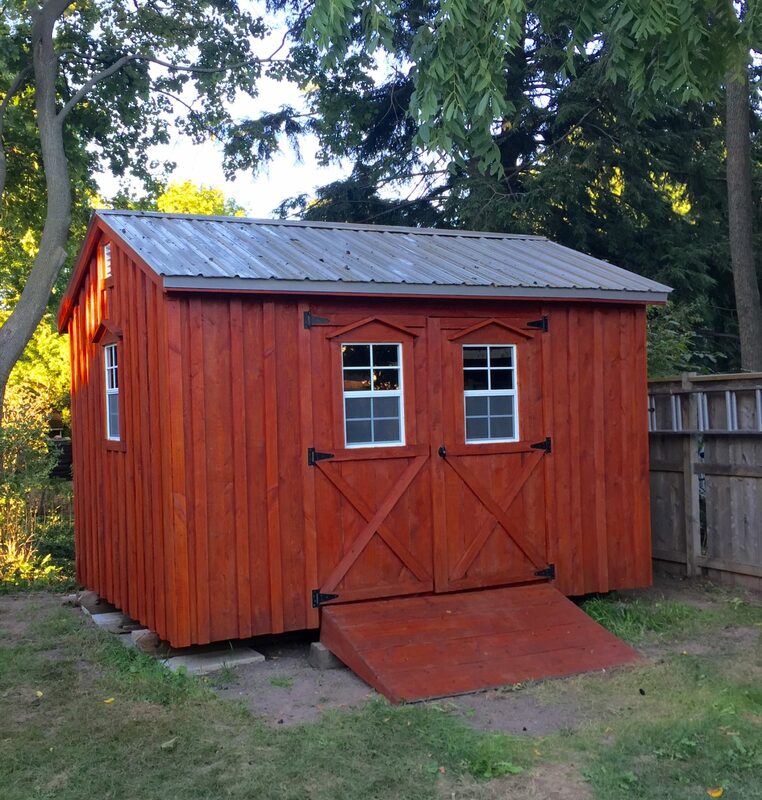 We are really pleased with our shed … Amish Sheds worked really hard to overcome many obstacles to get it into place and levelled, but he managed to get it in the perfect spot. The smell of the fresh hemlock is intoxicating … the boys can’t stop sniffing the walls! It’s a very solid construction, and will keep us safe and dry for years to come! 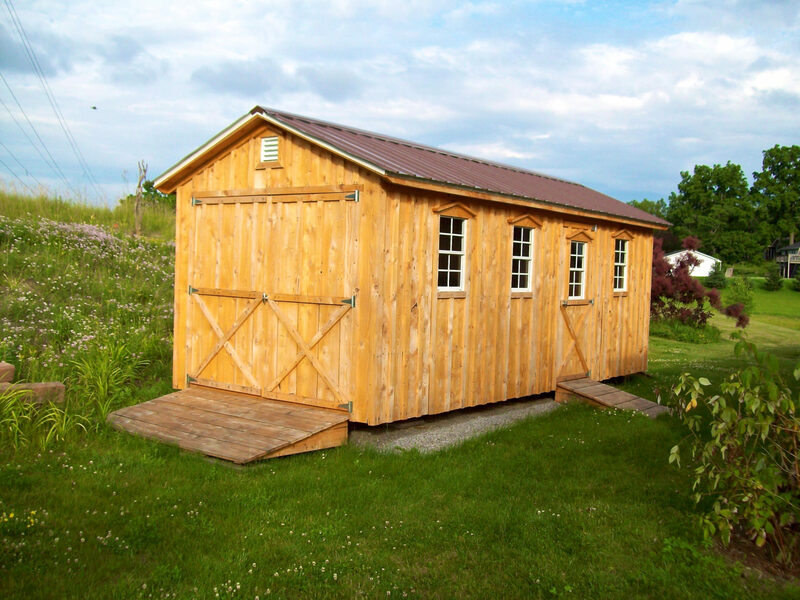 We love our Amish Shed.The hand made craftsmanship, the rustic look & the sturdiness will impress you.Amish Sheds are knowledgeable, professional & accommodating representatives.The shed is well built & sized to please.Our neighbours are all intrigued by the shed, everyone seems to want one.We recommend an Amish Shed & you will enjoy dealing with Amish Sheds. Joanne and Geof, Welland, Ont. I feel very fortunate to be an owner. 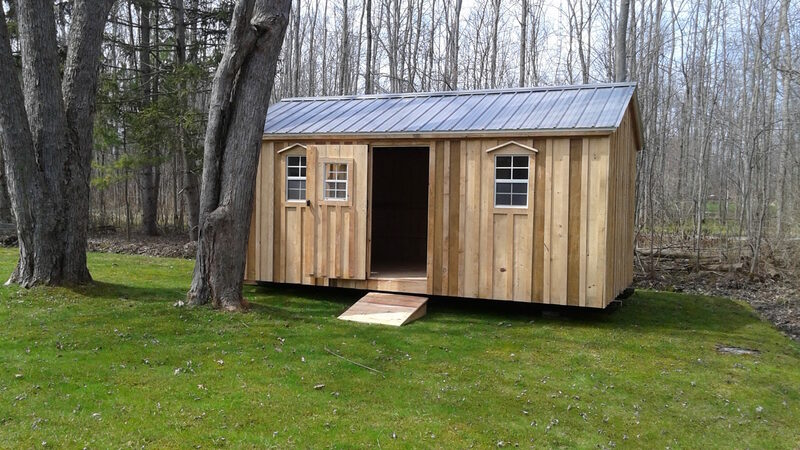 We were so very glad to have found amishsheds.ca. Prior to ordering our shed from you, we had planned on building one ourselves. As our property is not on the grid, it would have meant doing everything with hand tools or purchasing a generator and several weekend camping trips and perhaps months worth of work as my husband only gets every other weekend off, and weather permitting. Being able to have our “bunkie” built to our specifications and dropped off readymade within three weeks to our site was a God send. They did a fantastic job of manoeuvring it into the exact spot regardless of the pouring rain and slippery terrain. We know that we will be enjoying our “Bunkie” for years to come and are so very pleased at how it turned out that we would not think twice about purchasing another in the future or fear recommending your sheds to our friends and family. Once again we would like to thank you both, it was great doing business with you. Mark and Jenny, Chatsworth, Ont. We are very pleased with our Amish Shed purchase. 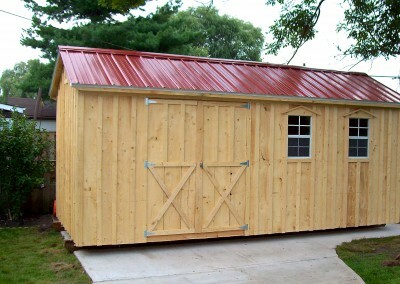 Dealing with Amish Sheds was a pleasure right from our initial meeting to our custom order to delivery. 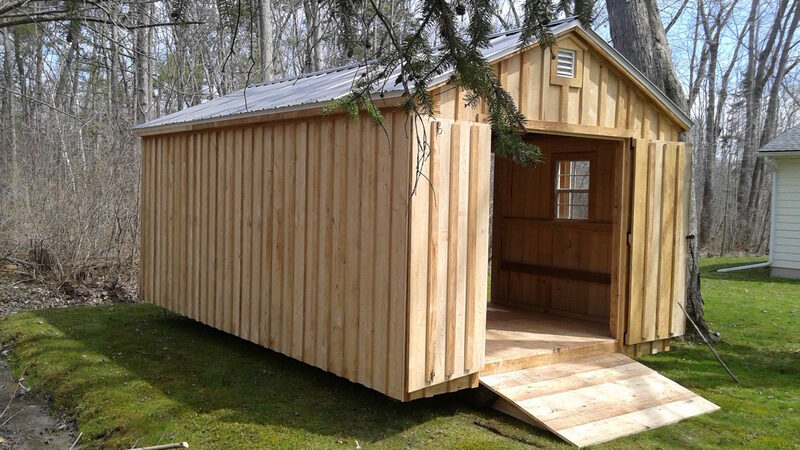 With our calculations we figured by the time you purchased the materials (real 2X4 construction) and spend the three weekends to build it we consider this shed is a great deal. We absolutely love our Shed!!!! We can fit our ATV, Riding Lawn Mower and SOOOO much more in it: and it looks amazing as well. It’s nice to have a break sit on the porch after a long day of yard work. Next year we plan to get the matching Playhouse……. Thank you so much. We couldn’t be happier. Ron and Carol, West Lincoln, Ont. Our shed was a perfect for the farm; it fit right in with the other barns. Plus we were able to design it to fit exactly a preexisting concrete pad and walkway. It was hard to believe we had it in place and used for storage just 2 weeks after we ordered it. Mike and I cannot begin to describe how happy we are with our new “manland”. We have hardly been inside the house since it arrived. We are slowly beginning to get things organized and I am so excited to have things in order so we can completely enjoy it all. I’m so glad that Mike was able to help as much as he did. I honestly cannot believe how hard they work to get the sheds in place! I’m really happy to have met you both, and you can certainly count on hearing from us when or if we move. I don’t think I could live without a shed like this ever again! My husband looked for a long time for the right shed for us. He finally found it on his way to a business meeting. Amish Sheds was very precise in placing the shed in the appropriate spot. I didn’t even have to move any of my flowers. The shed is a perfect size for us and looks great in our yard. I first saw the Amish Shed four years ago at the Toronto annual cottage show. At the time I did not have sufficient room on my property to install a large shed but that did not stop me from spending the next several years comparing the designs of as many prefabricated shed products that I could find that could be delivered in the Greater Toronto area. Nothing compared in terms of quality of workmanship and the superiority of the hemlock lumber. The siding is a full 1′ thick hemlock and the 2×4’s and 2×6’s are what the dimensions say, not 1/2″ smaller as with commercially bought lumber. This year we bought a new property in the old town section of Newmarket, Ontario so I ordered a custom 10′ x 20′ barn roof style with two car ports, a 7′ x 20′ on one side and a 6′ x 10′ on one end. Installation went smoothly requiring the help of two construction guys because we had to maneuver the shed between several trees and into a very tight spot to meet zoning regulations. These guys are professional carpenters doing the extensive house renovations required in our new home and they were over-the-top impressed with the strength and beauty of the shed. I should mention that this shed is installed within city limits where zoning regulations are very strict. Amish Sheds supported our every need providing all the Ontario approved engineering documentation required to get the building permit and get the final building approved. 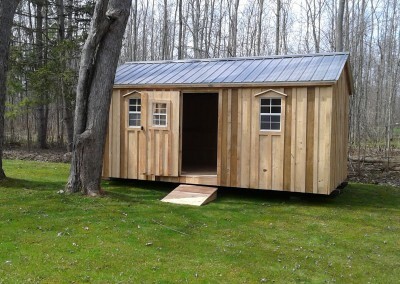 Amazing Amish shed….Our second one and we stay impressed…thank you so much. I just want to thank you for providing me with the perfect storage solution for our new property. This is our second Amish shed as we have been impressed for 4 years with the quality of our last shed at our other house. The ramp for the lawn tractor is perfect. I am so pleased with the amazing service from start to finish, always fast telephone response and continued right through speedy delivery in our time of need. Placing the shed in EXACTLY the right spot was precise. Thank you so so much, and if we ever need another we wont chose anything but an Amish Shed. Working with Bobby to plan a custom shed was an absolute pleasure! From the first phone call to the day of the prompt delivery I was treated with the utmost of professionalism. The open lines of communication led to our dream shed showing up quicker than I thought was possible. Our fairly large shed (11 x 28) was placed with precision in the back corner of our property after travelling down a delicate and narrow pathway, to say the least. As beautiful as the shed is to look at, we couldn’t be more pleased with the day-to-day usage of it. There is more than ample space for the mower, tools, toys and there is still room left for winter storage of the patio furniture. The kids treat it like their own playhouse and just love sitting on the porch while enjoying a burn on the fire pit. The workmanship and attention to detail are unparalleled. Due to the attractiveness, it has become he focal point of our backyard and a source of envy throughout the neighbourhood. I would recommend Amish Sheds to anyone. We couldn’t be happier with the finished product or the enjoyable process of getting it. I just wanted to drop you a quick note and thank you for all your efforts in getting us our new Amish Shed! As you know, we were on a very tight time crunch to have a storage building for our hay, in time for our daughter’s wedding, and you delivered!!!!! The 12×32 shed with 8 foot carport we purchased has been amazing, this out building could not be more perfect! We had researched a number of options including a canvas building and a steel building. All could have met our needs, however only your Amish shed had the visual attractiveness that we required. Even though these buildings are primarily used for storage, why buy and install something UGLY. Your shed solution may not be the least expensive, however, it is in our opinion, worth every dollar we spent. Please feel free to use me as a reference and if you have any clients that would like to see a shed, please offer up our site for a visit. We are very happy with our Amish shed. We were looking for a decent size shed to hold lawnmower, garden tools, snowblower etc. When we came across the Amish Sheds, we were really impressed by the craftsmanship and the overall look. Investing a bit more on a quality shed like this is guaranteed to pay off in the long term. This shed feels like it will last forever! The delivery by flatbed truck into our backyard was nothing short of amazing! With not much room, we only needed to put down four patio stones as a base and the driver maneuvered the shed into place in a really tight spot. That was it, shed done! This is as good as you can get in regards to quality and service! Thank you! I love it! The hemlock is terrific and is extremely hardy. The quality of the workmanship and accessories is really good, so I expect it will far outlast my lifetime. And thanks for the exceptional service –The delivery was easy, on time and friendly. I highly recommend your sheds to anyone looking for an attractive shed of high quality. Several years ago we decided that it was time to upgrade from our outdoor fabric shed to a shed that would last a lifetime. 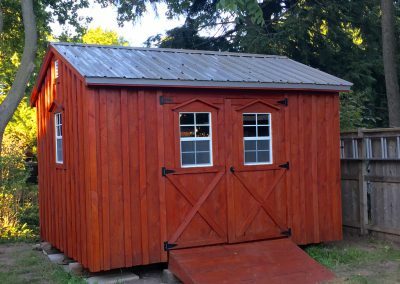 Due to the location that we wanted to place the shed in our yard, I believed that we either needed to build one from scratch or buy a kit that could be dragged into the back corner of the lot so that I could assemble it. During my research I ran across this website and started reading all the testimonials and what really caught my eye was reading about easy it was to deliver the shed into almost any area of the yard as long as there was access for a trailer. I can assure you that the testimonials are accurate. Brad delivered the shed and placed it to within an inch of where we wanted it positioned. Another piece of detail that you should be aware of is the quality of this shed. They are built using hemlock wood and not the locally grown spruce or pine and will last a lifetime. The timber is rough cut to the old imperial dimensions (a 2 X 4 is a real 2 X 4) and actually looks better in person versus the pictures. It is a solidly build shed and looks great in our backyard and the compliments are already flying around in the neighborhood. Thanks Bobby, we appreciated dealing with you and have nothing but positive things to say about how well we were treated and how you delivered exactly as promised. That was a refreshing change from the norm out there these days. Chuck & Betty, Wales Village (Ingleside), Ont. It has now been a year since I took delivery of my 10X20 shed. I have nothing but positive reviews for this purchase. The build quality is exceptional - This really is designed to last forever. From the skids it rides on, the ramps, doors and to the roof above, no detail is overlooked. I’ve managed to add electrical and have put stain/sealer on it. The process of delivery was, for lack of a better term, fun. Using simple techniques, we were able to wedge it into place with surgical precision. Levelling only took a couple of minutes. INSTANT shed. If you’re on the fence about how to go for a backyard shed - please do yourself a favour and seriously consider this option. Jeff G. Fort Erie, Ont. 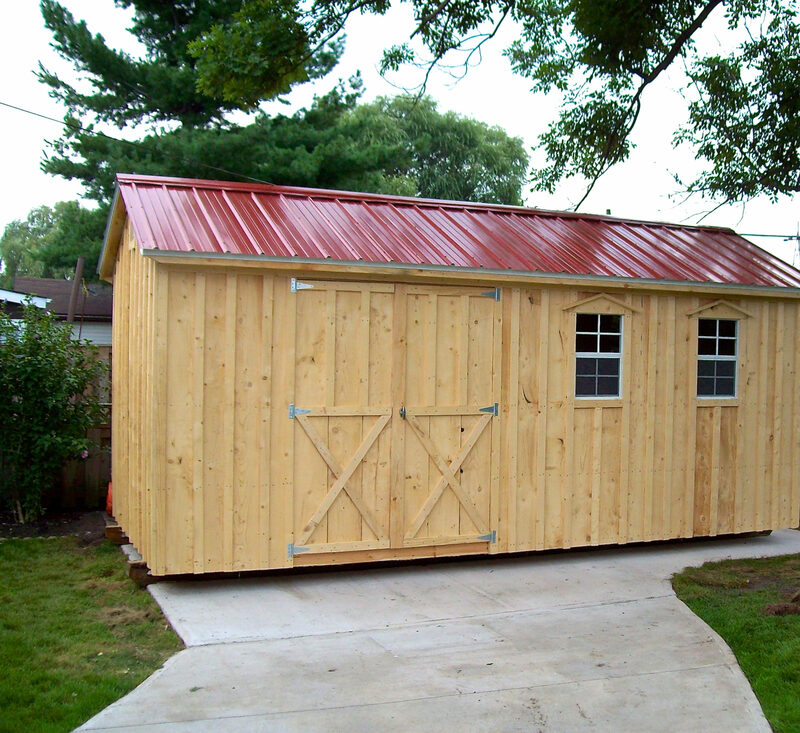 In addition to the quality of the construction of our Amish shed (10′ X 22′) . . . Frank was very happy with the professional handling and delivery of the shed. They delivered, off loaded and settled the shed into a difficult location on our property, all without hesitation. This positioning of the shed (now called the Blacksmith Shop) was very important to us and they made it happen! We are so pleased with our new shed which doesn’t look so much like a shed at all, but more like a beautiful addition to our property! We admit to being a bit skeptical about making such a large purchase sight unseen, but you handled the transaction so easily from helping us choose the best unit for us (your website is so accurate and easy to navigate), facilitating the transfer of funds, to the swift and expert delivery and set up. Everything went flawlessly. The product is more perfect than we ever expected with solid construction and an attention to detail that shows just how long the Amish have been producing these - the engineer’s letters were supportive as well. Thank you so much for making this experience so satisfying! David & Susan MacKay, St. Charles, Ont. Two years ago I needed a shed, but I wanted one that would be the focal point in our backyard so that we could decorate around it. 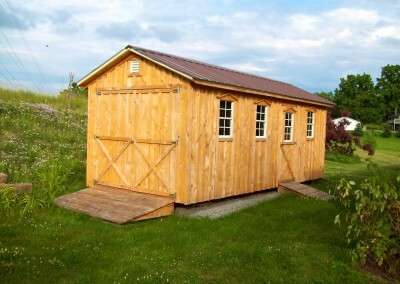 After an exhaustive search, we found that the “AMISH SHEDS”.CA FIT THE BILL. Very well built, reasonably priced in comparison to competetive models, and Amish Sheds will service any issue that needs looking after, as we had a small problem, that they looked after to our complete satisfaction. Thanks again. Darrell and Mary Karas Barrie, Ont. The shed I purchased from AMISH SHEDS is fab-u-lous !! All my neighbours comment on how great it looks from the outside, and then they’re even more impressed with the inside. The construction is very sturdy and strong. They did a great job setting up the shed. If you are looking for a solidly built, fairly priced, all wood, metal-roofed shed, look no further! After a bit of comparison shopping, we knew this was the way to go. We ordered our 6 x 14 lean-to shed a few weeks ago and had it delivered earlier this week. 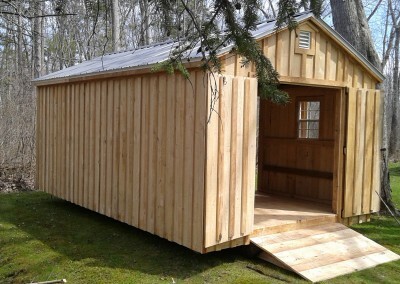 From design to delivery, Amish Sheds were great to work with and paid great attention to detail. They arrived with our shed and true to his word, within 3 hours had it perfectly placed, leveled and tucked in against the house. He was very careful and didn’t do any damage to our wall, roofline or grass (except a few tufts which he tamped down) nor to the neighbour’s fence, shrubs, driveway or lawn. And yes, he took off his boots when he came in for some pizza, and was very patient with our kids. Using some well-oiled beams, Their magic with a pair of 70 lb. jacks, a bit of leverage and the help of one of my neighbours, the three of us were able to very easily move the shed into place. In fact, the very first time we moved it, we pushed it too far. There was absolutely no heavy lifting at all. If you live in the Ottawa area and need to see it to believe it, please contact Amish Sheds and we can arrange for you to come over to see it. We love our Amish Shed and the best part about it…we were able to give them a drawing and the shed was custom built for us! Amish Sheds are extremely helpful, excellent reps for the company! And the shed itself, very well built. It will stand for many years to come!